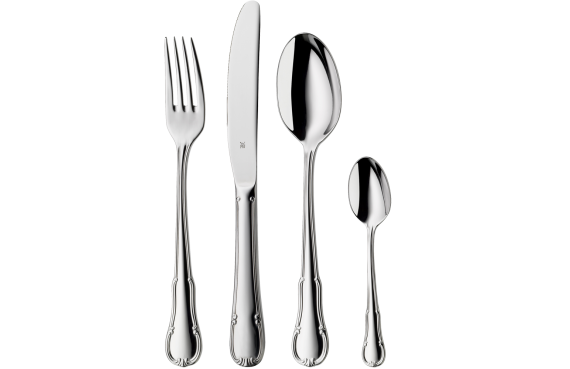 BAROCK, the well-proven cutlery line from WMF Professional, has a new silhouette. 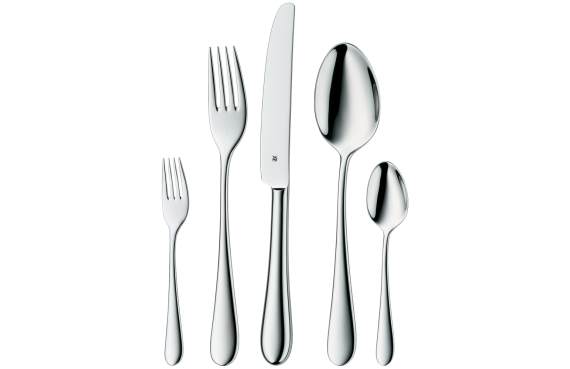 So now this subtly composed flatware in classic design complies even more closely with the modern-day requirements of quality table culture. 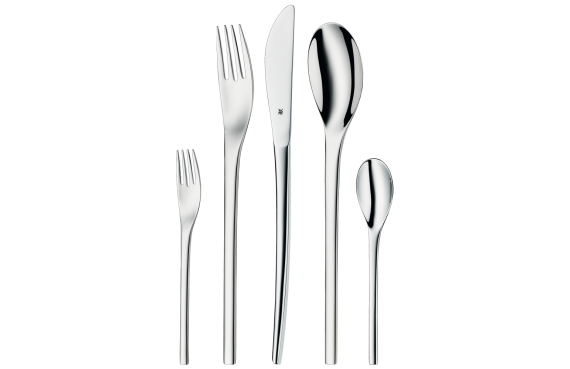 The main innovations are adaptations in proportion and size: selected items of the flatware are longer and the material itself is now perceptibly thicker. So the visuals will appeal to guests, and so too will the haptics. JUWEL offers you extraordinary design from Jette Joop for professional use. Each individual piece is a real delight, both in form and appearance. The complex faceting on the handle's end is reminiscent of finely-smoothed gemstones, and makes each piece of cutlery a sparkling highlight on any table. The exquisite collection goes particularly well with equally exquisite porcelain. With JUWEL cutlery, you can always be sure of a festive mood – whether on special occasions like birthdays or weddings, or for everyday use. We feel that the NORDIC collection of cutlery, with its extraordinary lines and thin silhouette, perfectly complements the trend for all things Asian which has been inexorably finding its way into the restaurant industry. Every piece of this cutlery series is a special treat - both to look at and to feel. Nonetheless, it still meets guests' expectations in terms of functional, well-balanced cutlery that maximises their dining pleasure. 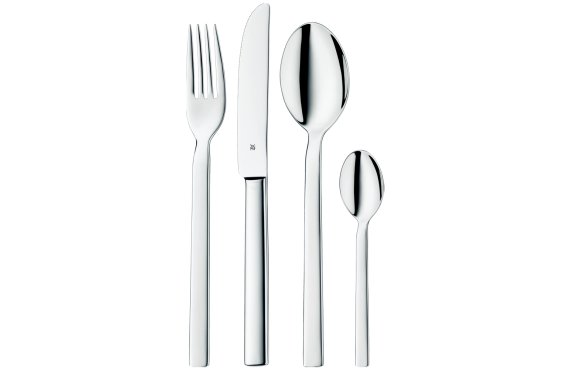 The CASINO collection blends simplicity and elegant lines to create a range of cutlery that suits any type of porcelain or setting. 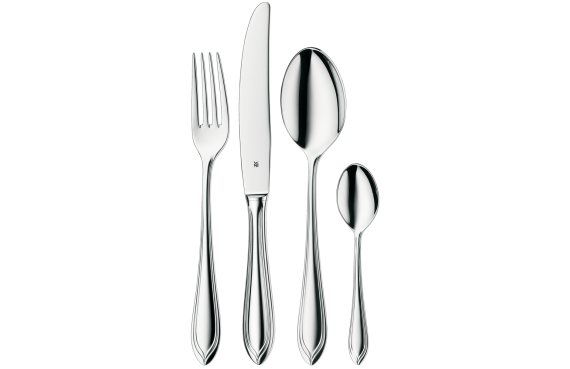 Available in perfect silver plating or made of polished Cromargan®, give your guests cutlery that not only sits comfortably in their hands but is also a beauty to behold. 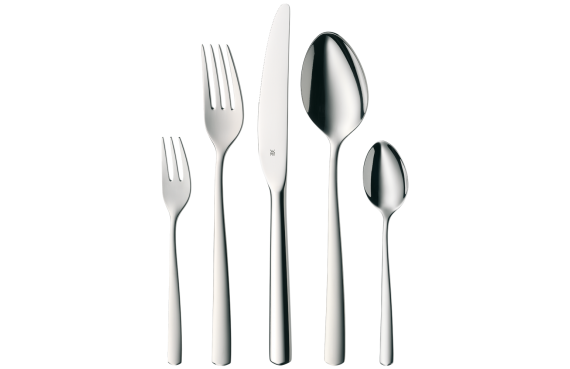 Each individual piece, from fork to monobloc knife with a serrated blade, forms part of a well-rounded set that blends in perfectly on any table. Unusually-shaped handles make the SOLID collection an eye catcher and a unique addition to any table setting, from breakfast to supper. 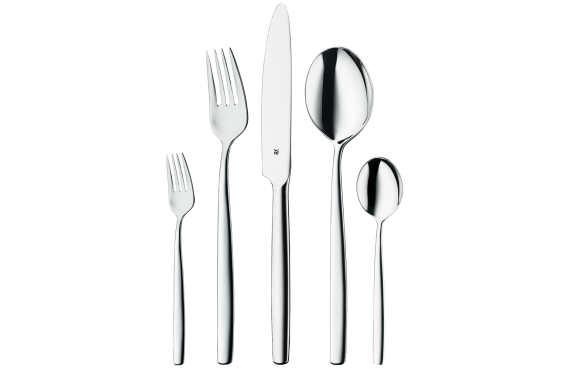 Each individual piece of cutlery is perfectly balanced and sits comfortably in your hand, and yet their extraordinary yet dignified appearance fits in with a number of décors and porcelain ranges. Simple dishware is accentuated while more lavish table settings are complemented; instead of taking the spotlight, the collection subtly remains in the background without being overlooked. 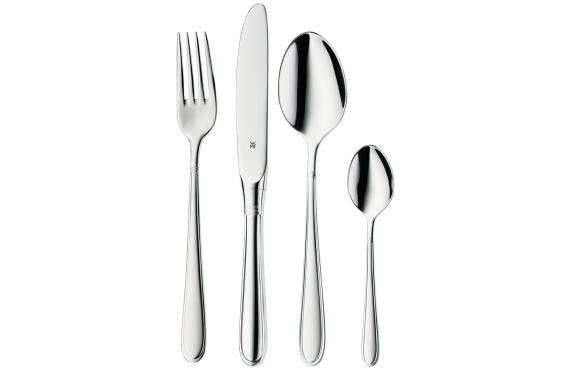 With the BASE collection WMF offers a cutlery line characterised by simplicity. 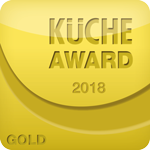 Thanks to its flexibility this timeless collection is the perfect choice for everyday cooking. Comprising a total of 12 items, BASE accompanies your guest from the starter to the main course right the way through to dessert and coffee. 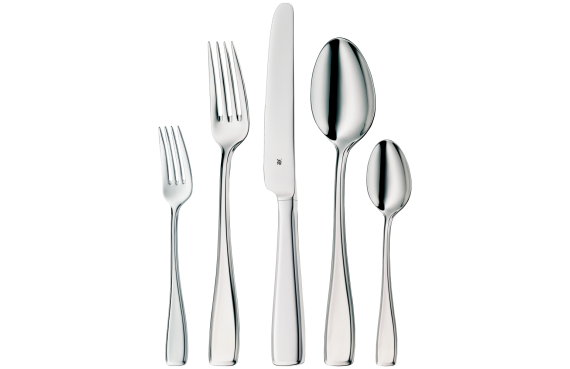 The modern, straight-lined design of BASE cutlery means it can be combined with various porcelain styles and decorative pieces. The pleasant feel makes every piece comfortable for your guests to hold. The UNIC cutlery model from WMF makes a great impression with its clear, functional shape and harmonious proportions. The design-oriented model is modern in character yet gives a classical overall impression. Thanks to its geometric lines UNIC blends well with both modern porcelain and timelessly classic designs, and works just as well at the breakfast buffet as at the dinner party. Simplicity is key in the GASTRO range. 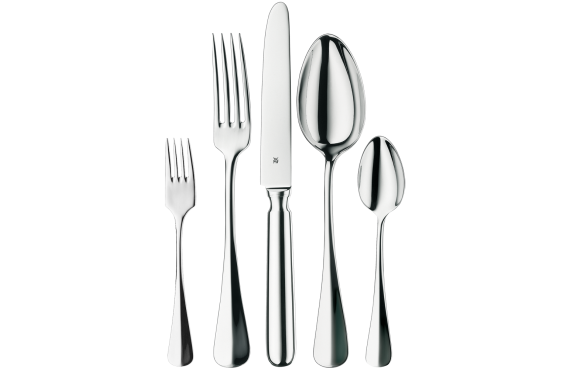 The harmoniously and similarly-shaped items in this cutlery collection have clearly contoured silhouettes without any flourishes or embellishments. Each piece in the set shares the same visual appearance and easy handling. 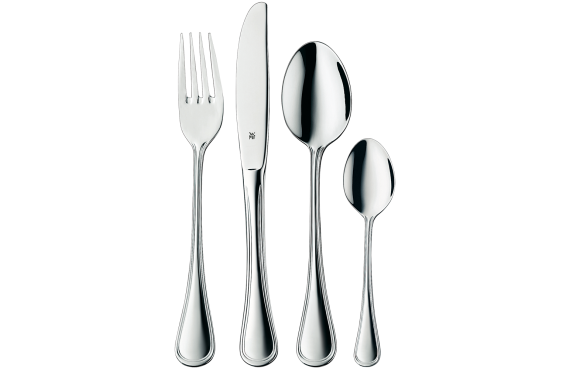 Yet the model's elegant proportions also make this cutlery suitable for a wide range of uses. Depending on the table decorations and porcelain used, its visual charms either fade into the background or take centre stage. Two things that never change, however, are the high quality and perfect balance that make eating with GASTRO such a pleasure. The SIGNUM line from WMF creates a modern and intimate ambience at the table. The collection is an appealing and harmonious companion for every type of porcelain, whether at breakfast, lunch or a multi-course dinner. 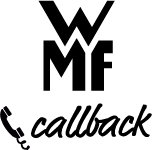 The design combines the traditional rounded handle with balanced, clear lines. The result is not only a simple and perfectly-styled look, but a smooth culinary experience as well. 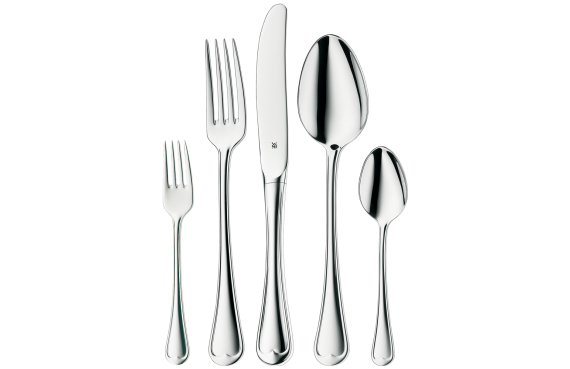 The sparkling CONTOUR range from WMF uses gently curved lines to set impressive accents whatever the occasion. Whether lavish breakfasts or festive feasts, the simple yet traditional design blends seamlessly into any table setting. The fine surface stamping also renders elegant shine to the ensemble. 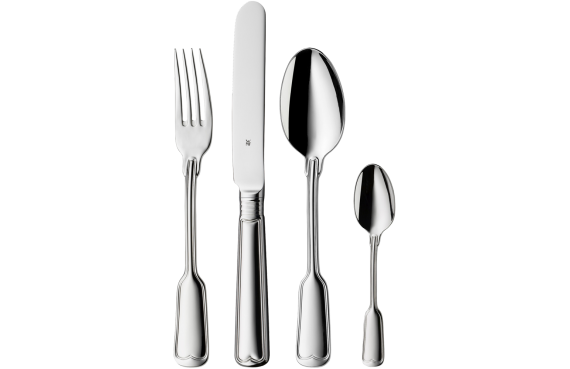 The feel of the set also adds to the culinary pleasure for your guests: the narrow handles of each piece lie softly in the hand, while the well-balanced dimensions keep the cutlery stable. With its pointed tip and specially emphasised silhouette, the FLAIR collection is sure to be an eye-catcher on every table. Simple yet exceptional, this cutlery is perfectly suited to every occasion, particularly for festive tables. This series is designed to complement simple porcelain and reinterprets traditional table settings. When combined with unusual dishware, FLAIR highlights its unique qualities without being overpowering. 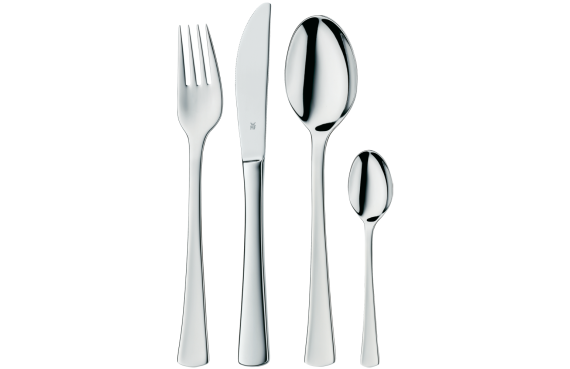 Like all WMF cutlery, FLAIR also sits perfectly balanced in your hand and makes mealtimes a pleasure. 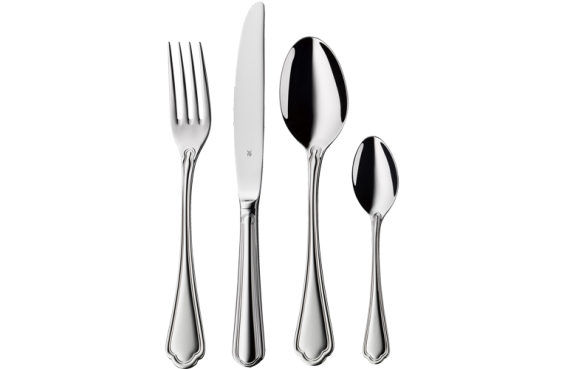 The CLUB cutlery collection from WMF is low-key at first glance, yet that is precisely what makes it so extremely flexible. 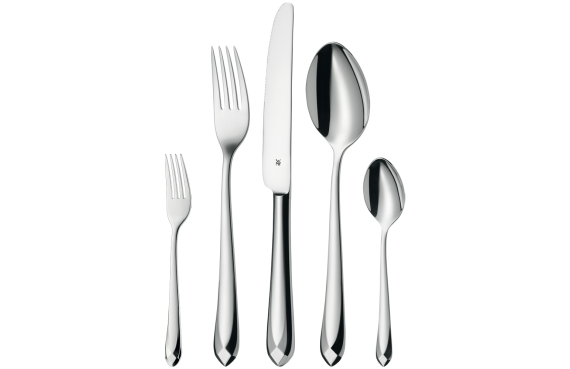 The graceful lines see to it that each and every individual piece is perfectly balanced in your hand, and the decorative line emphasises the silhouette and makes this cutlery ideally suitable for both simple and opulent table settings. CLUB works well with simple porcelain, from breakfast to supper, and is happy to fade into the background when paired with more lavish dishware. The BAGUETTE collection is ready for the table - simple at first glance, yet still full of surprising details. This product range doesn't just contain table cutlery but also special items like oyster forks and iced tea spoons. The series is particularly suitable for traditional restaurant settings, and manages to catch people's attention without seeming garish or ornate. Surprise your guests with cutlery that sits comfortably in their hands and knives that always make a clean cut, either with hollow handles or as a monobloc. With its geometric design, the MONDIAL cutlery collection accentuates both simple and special tables to add that little something special. 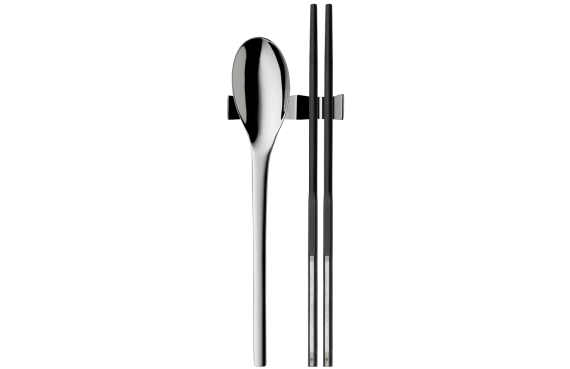 This premium cutlery goes especially well with simple porcelain, next to which it becomes a striking eye-catcher. Similarly, each individual piece can also fade into the background if paired with dishware with a stand-out visual appearance. 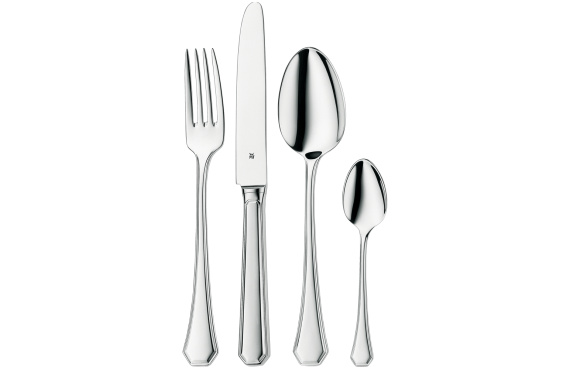 Like all WMF cutlery, MONDIAL sits perfectly balanced in your hand and is ideal for fine dining. The RESIDENCE collection interprets Baroque style in a new way, and replaces opulence with clear lines. 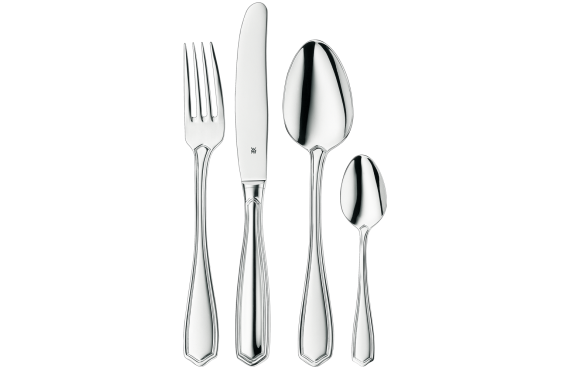 This cutlery is an ideal choice both for sophisticated, stately settings as well as especially festive occasions. Whether good, traditional fare or haute cuisine - a perfect table setting featuring this series will let your guests enjoy any dish in a special way. RESIDENCE goes equally well with simple porcelain as with designs that incorporate the shapes and lines found in the cutlery. 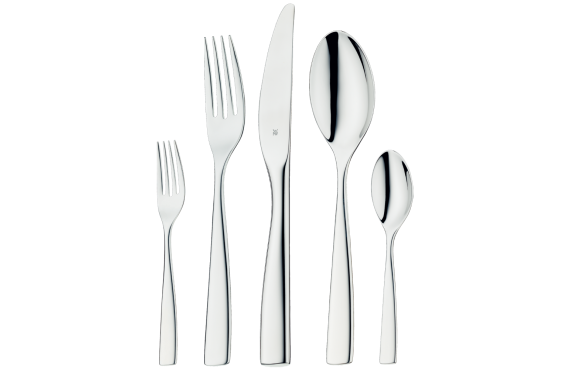 With the METROPOLITAN collection WMF has created a series of cutlery that exudes its own individual style. Sweeping lines culminate in an understated yet memorable stylistic element at the end of the handles, to make this series distinctive. The range is just as perfect for traditional table settings as it is for breakfasts or festive dinners. Clear and stylish, METROPOLITAN adds an element of beauty and function to every table. WMF ASIA fuses the charm of the Far East with the dining culture of Europe. Foreign cultures have always had a magical effect on people. In the era of long-haul travel and cosmopolitan tastes, the exotic has become the expected. Surprise your guests with WMF ASIA, and combine Asian flair with western quality standards. WMF ASIA fuses European and Asian dining cultures, creating a perfect atmosphere and aesthetic appeal.